This house was designed and built with entertaining in mind. There is a 3,000 sq ft covered portal surrounding the living and dining areas. The 35′ ceilings in the living and dining areas are framed with enormous windows to preserve the feeling of an extension of the gorgeous setting and panoramic expanse. There is a cozy library/den with a low ceiling and a wet bar off the grand living area. The master suite has a private east facing patio perfect for enjoying the serenity of a sunrise over Taos mountain. This horse property includes a corral, stable, exercise room and greenhouse in a separate building and 16 acres of water rights. The Mariposa Ranch house offers a feeling of seclusion and privacy while being only 20 minutes from the Town of Taos and Taos Ski Valley. This is a rare opportunity; a sophisticated yet comfortable home with ample room and privacy and a thoughtful nod to the traditions and designs of the ancestors that first settled in this area of Northern New Mexico. Take a Virtual Tour. Introducing the Mariposa Ranch of Taos. 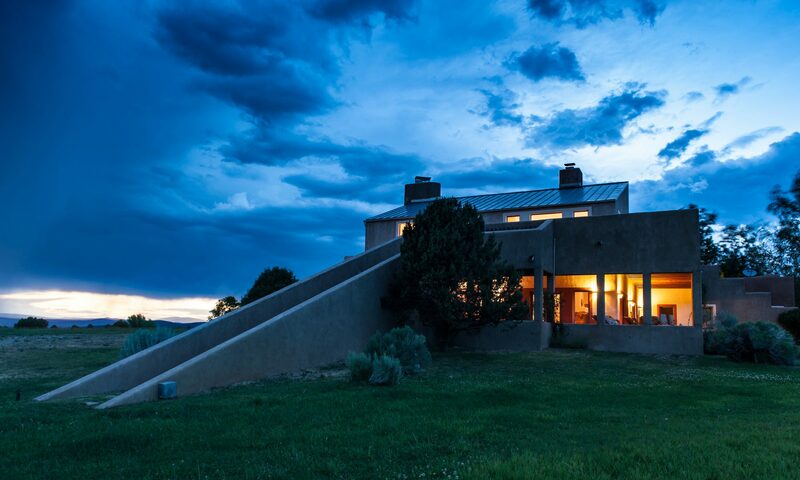 Described as “a poem on the landscape” by Architect Antoine Predock, this majestic 5,000+ square foot home was designed as a surrogate mountain nestled on the vast plain of Des Montes between the Town of Taos and Taos Ski Valley. to draw one in from the vast expanse of surrounding land. There is a honeysuckle covered trellis that directs visitors to the grand entrance of the home flanked by a beautiful fountain and charming guest house to the right. Once inside, you will see the interior and exterior staircases and bridge that serve as the north-south axis or crossroads of the house with the living spaces set off to the sides.